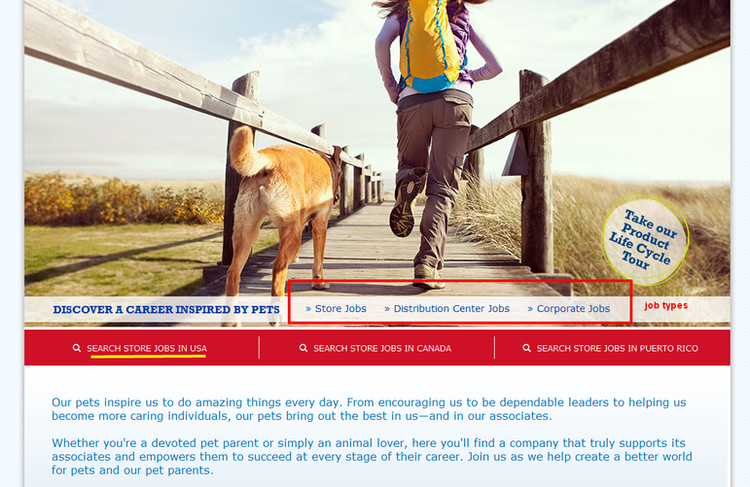 Visit careers.petsmart.com or Whether you want to in store, at corporate or distribution, PetSmart provides you an opportunity. 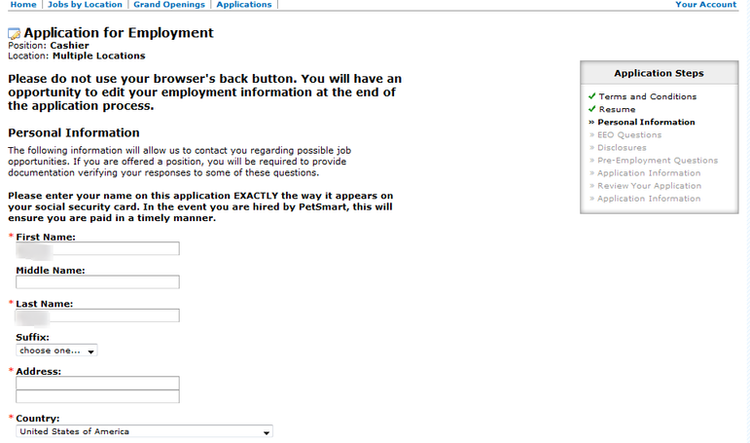 Considerately, PetSmart explain what those job types are, what the job contents are, scroll down and there is it. Choose a job type that fits you, click on it to move on. For the store applicants, there are three countries to be selected. We take “SEARCH STORE JOBS IN USA” as an example. You can search through city and state name or your zip code. We take zip code search as an example. The result is all the locations within 25 miles. Click one to continue. You will see a list of job openings, pick one that you are competent to. Read the job description and make sure you are about what you are to going to do. Click on Apply Now if you think you are ready. 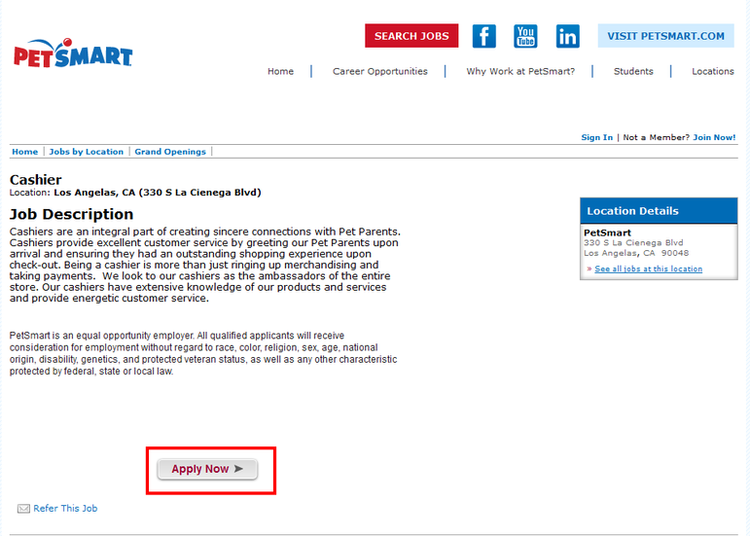 PetSmart offers to apply several positions at the same time. If you are interested in other locations, check them in their boxes. Here you need to know some disclosures. Click Next to go on. 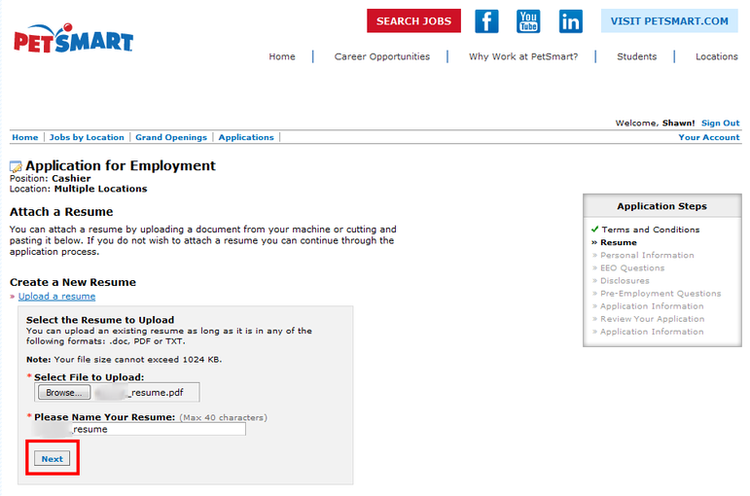 Upload a resume to supplement you personal information and file. 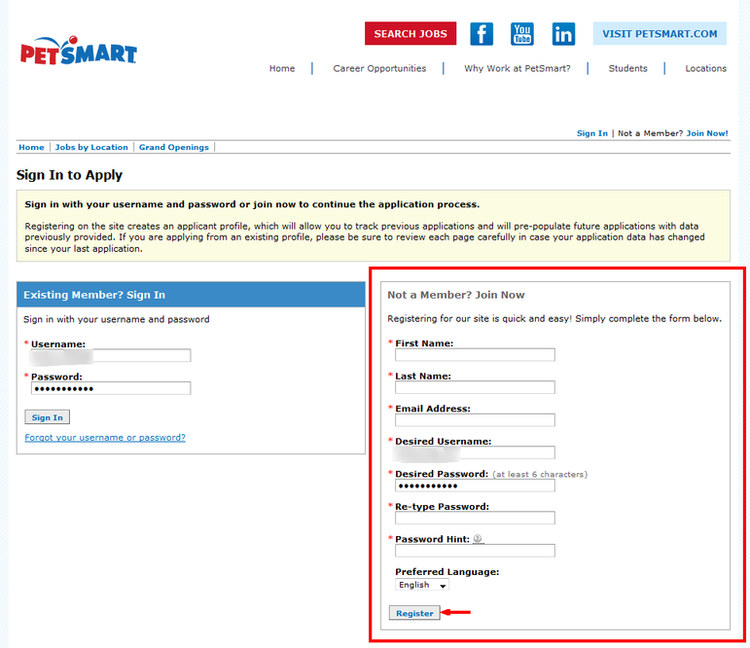 PetSmart allows you to attach your CV through three ways: from your computer, from other website and LinkedIn. There is a series of disclosures and questions including EEQ questions and Pre-employment questions to be checked and answered. Please give your authentic information. All you need to do is to pick answer for one-choice questions. If you didn’t get this page, please go back and check to complete this step. Answer these questions with your patience and real situation. 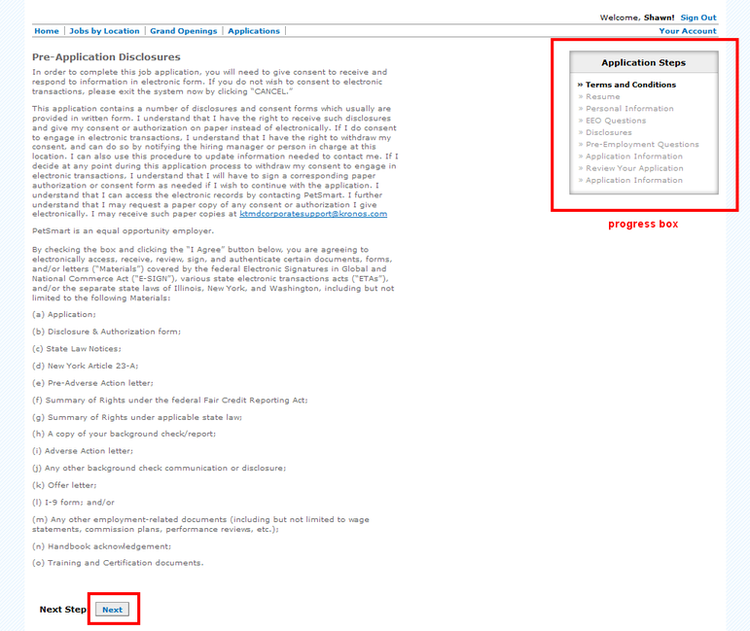 With this, you have to make sure that you have finished all the steps above, otherwise an uncompleted application can be rejected by PetSmart. 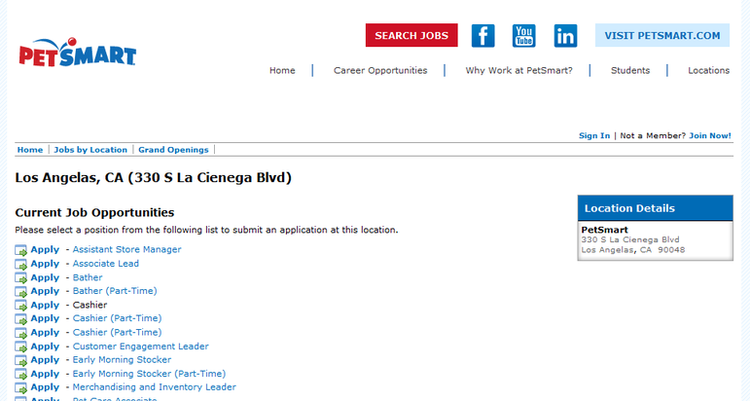 Click careers.petsmart.com to apply for PetSmart jobs online.